You can be treated quickly, safely, and without fear by an Atlanta sedation dentist in a hospital setting while under general anesthesia. Working in cooperation with Wellstar Kennestone Hospital in Marietta, Georgia, Dr. Kurtzman performs all general procedures including cosmetic, implant, and restorative dentistry in an operating room equipped especially for dentistry. A trained anesthesiologist and surgical nurses work with Dr. Kurztman to provide these procedures in the safest of all environments. Hospital sleep dentistry offers unique benefits compared to traditional dentistry. In less then nine (9) hours, we can often fix a person's entire mouth, handling a series of procedures that would normally take several office visits. Most people who choose this hospital option are able to return home on the same day as their visit. If you suffer from dental phobia or a severe gag reflex, please know that we understand your fears and concerns. This treatment option offers you a solution to the cycle of anxiety and embarrassment that keeps you from seeking treatment. You are completely asleep while we give you a healthy, beautiful smile -- without fear. Sedation dentistry can also help if you have a medical condition that makes it unsafe to be seen at regular office or of you have a developmental disability such as Autism, Cerebral Palsy, Fragile X or others. 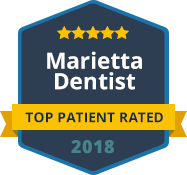 In Georgia, Dr. David Kurtzman is one of the only dentists who can offer you this option for full-service dental, cosmetic, and restorative treatment in the hospital operating room under general anesthesia. Please click here to see our Sleep & Sedation Dentistry FAQ's. If you are looking for an experienced sleep/sedation dentist, please contact us today. Call or contact our Atlanta Sedation Dentistry office to schedule an appointment. Dr. Kurtzman has a deep expertise when it comes to sleep and sedation dentistry.